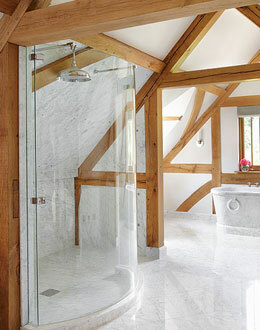 Q What is a frameless shower enclosure? A A frameless shower enclosure consists of fully frameless toughened safety glass fitted together using wall & glass mounted components. Unlike standard shower enclosures, our frameless range does not use the likes of ‘U channels’ to attach the glass to walls. This means we can shape glass to suit any wall or floor that is uneven, bowed or angled. Q The walls where I want to put a frameless enclosure are not plumb, is this something that you can accommodate? Q Does the bathroom need to be completed prior to measuring? A Yes. Because there is no adjustment when using a frameless shower enclosure, all installations of trays & tiling need to be completed before a site survey is carried out. Once measurements have been taken you will not be able to alter the area where the enclosure is to be fitted. The installation of the enclosure can be compromised should any adjustments be made to the showering area. Q Does the glass comply with safety standards? Q What is the best way to clean my shower enclosure? Q Is a frameless shower enclosure water tight? A Showerpower showers use ‘push fit’ waterproofing seals on every shower enclosure manufactured. The water tightness of your enclosure will be very much dependant on the situation it is being used in. Items such as a body jet or shower rose can cause some leaking if aimed directly at the door seals. We can not guarantee the water tightness in such cases. Please discuss any concerns you have about water tightness with us as we evaluate each order separately and we can design your enclosure to incorporate the most effective way of waterproofing. Q How easy is it to fit a frameless shower enclosure? A Each installation is unique to the individuals needs. A simple walk in panel can be fitted fairly easily where as a full enclosure incorporating angles would require a certain level of skill. Installation sheets are provided for every shower enclosure however, Showerpower offer a site installation service to take away the need to find a suitable installation team. Please look at our Site Survey & Installation Guide for further information. Q I have very thin walls in my bathroom; can I still install frameless shower enclosure? A When looking at having a frameless shower enclosure fitted into your bathroom, wall construction needs to be a big factor in how your bathroom is built. Walls need to be of a solid construction as a pair of hinges can carry a weight of up to 40kgs of glass. Discussing your requirements early into a build or refurbishment can be of huge benefit. This gives us the chance to evaluate all fixings that are required for your enclosure, which then we can recommend where extra stud work or fixings are required.